Most children in the West have at some point heard the following phrase at the dinner table: “finish your dinner, there are kids in Africa who have nothing to eat!” This was always an annoying argument to hear, because while I saw right through the emotional blackmailing parenting strategy, the annoying part about it was that it worked. At a very young age I could already understand this meant I had to be grateful for having food on my table, while other kids did not. And therefore, to demonstrate appreciation for my privileged life I had to eat the soggy zucchini on my plate. Fair enough, I ate it! And for most of my life, this was pretty much the only vision that would burden me when I would waste food: the hungry kids. Well, our parents were right; there are in fact still millions of hungry people all across the world, but this is only one of the many reasons why we should finish all our dinner. Throwing away food is an offensive action in its very essence. Our parent’s blackmailing at least served to plant the seed of shame every time we throw away perfectly good food, which is why we tend to wait until the leftovers have turned green, and we can discard them as “inedible.” To the average consumer, there might be a very big moral difference between throwing away a new and sealed jar of tomato sauce, vs. throwing away the last piece of leftover lasagne. Very different right? One has never been open, and the other was three days old and was starting to dry up. But waiting until something is rotten is only a coping mechanism to detach ourselves from the immorality of the act itself. We may no longer feel bad; but food, and its entire environmental and economic footprint is still being wasted. …there are in fact still millions of hungry people all across the world, but this is only one of the many reasons why we should finish all our dinner. 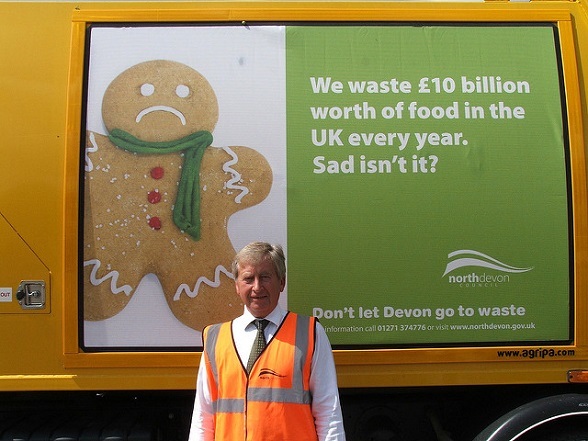 In the UK alone, 7 million tonnes of food end up in landfills every year. This is not only 7 million tonnes of food that could have been served to the hungry; food waste is so much more than just the wasted opportunity to feed somebody. Our eating habits have a direct influence on the environment, the economy, society, and of course our health. What happens when we waste food? 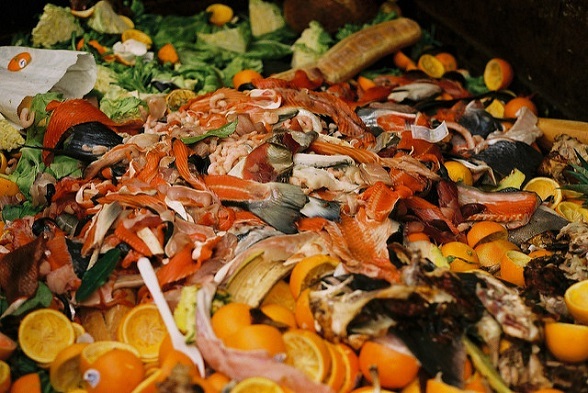 Food waste produces a huge amount of pollution. Every step of the food supply chain produces enormous amounts of greenhouse gas (GHG) emissions through the extensive exploitation of natural resources; such as the use of land, water, energy and fuels. The food sector (considering the entire supply chain; including fertilizer manufacture, agriculture, processing, transport, retail, household food management and waste disposal) is the sector with the largest contribution of GHGs, making up to 19-29% of global man-produced CO2 emissions. When we waste food, such as that 3-day-old piece of lasagne, we are ultimately polluting in vain, and wasting all the resources that were required to produce that item. Just to give some more scary numbers: a study from Oxford Journals states that “Agriculture consumes about 70% of fresh water worldwide; …approximately 1000 liters (L) of water are required to produce 1 kilogram (kg) of cereal grain, and 43,000 L to produce 1 kg of beef.” So next time you leave that stake on the grill too long, remember it is not just the cow’s life you are squandering, but almost as much water as if you took an 8 minute shower every day for two years. But I will stop with the environmentalist “stop eating meat, if not for your our health do it for the rest of us” lecturing, and suggest that you watch COWSPIRACY if you haven’t seen it yet. The European Union wastes around 88 million tonnes of food each year, and organic waste represents 30% to 40% of European’s household waste. All of this adds up to about 143 billion euros, wasted! Lets talk about MONEY. Money is always an easy incentive to do anything. Throwing away food is essentially throwing away money. The European Commission estimates the average household wastes about €600 on food waste per year. Money is also wasted along the supply chain in the form of labour and time. These are efforts that could be better invested into the production of more sustainable foods, or in other productive efforts. In addition to the adverse environmental impacts of food production, there are also ethical, social and health issues associated with food waste. While in some parts of the world obesity is on the rise, in many other regions malnutrition, undernourishment and food insecurity are increasing. The global population is expected to grow to 9 billion people by 2050. If we are failing to feed 7 billion, how will we feed 9? The amount of food that is thrown away by supermarkets, restaurants, schools, and all other catering businesses is an issue of even greater devastating proportions: 1/3 of all food produced in this world is wasted. This is more than 1 billion tonnes of food per year. Please analyse the ridiculousness of this figure for a minute…this figure is the proof of our enormous failure to effectively manage our global food system. This figure is a disgrace to human competence. There are many factors that contribute to this monstrous global food wastage. Our food supply chain has many stages, which introduce a lot of levels of handling , where different standards and scenarios may lead the food-item to be discarded as “spoiled.” Food waste is caused by a number of reasons across the supply chain, such as; poorly implemented or non-existent policies and regulations, social and economic factors such as consumer and worker’s behaviour, legislative barriers on quality, or also the leniency or strictness of international trade agreements. To address this grave issue of our inefficient food systems, the United Nations adopted the Sustainable Development Goal (SDG) 12.3, which sets the target to halve (50%) global food waste per capita by 2030. Although not legally binding, this SDG establishes food waste as a global issue, and calls on all governments to fix the gaps of their broken food-systems, quickly! Tackling the issue of food waste across the European Union has many different complexities. While there are huge disparities between Member State’s political will, and economic and regulatory capacities to implement the EU’s solutions, the reality is that the EU has not proposed many solutions thus far, and instead has very weak policies for the prevention and management of food waste. For example, in the EU today, there is no common methodology to measure food waste across Member States, there are no reduction targets, and above all there is no official definition for “food waste.” These are only some of the many political weaknesses that currently allow the European food-systems to be so wasteful. However, in light of the SDGs, there is growing political momentum to address all of these policy gaps, and to set the legal framework in order reduce the enormous amounts of senseless and unnecessary food wastage across the Union. The European Commission is in the beginning stages of establishing a platform dedicated to food-waste prevention. The EU Platform on Food Losses and Food Waste is made up by 70 members from public entities, NGOs, academia, and trade and business associations, whose collective aim is to work together to develop a methodology for the prevention of food waste, share best practices and evaluate progress. The development of this methodology is a crucial tool that will enable the EU to begin a transition towards stronger food-waste policies, and in turn, guide Member States to have more conscientious, resourceful and efficient food systems. Nevertheless, Member States have the power to get ahead of the EU policy process and act independently to implement their own measures at home. For example, Italy recently passed a law that makes it easier for companies and farmers to donate food to charities, while also encouraging the use of take away baggies in restaurants. Other MS should demonstrate this same leadership, and learn a thing or two from Italy’s relationship to food! While the issue of food waste is starting to make noise in the political arena, many local authorities and grassroots movements have taken initiative to reduce food waste in their communities and at home. At the beginning of 2016, Copenhagen opened the first food-waste supermarket in Denmark. WeFood sells surplus produce at 30% to 50% cheaper than at regular supermarkets. 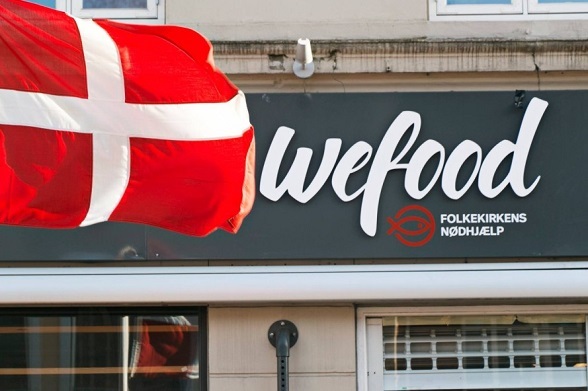 By establishing partnerships with local supermarkets, bakers, butchers, and producers of organic fruits, WeFood aims to help Denmark reduce the 700,000 tonnes of food that is wasted each year. Food waste supermarkets have started to pop up across Europe, and while they are extremely popular among people who seek to be part of the food-waste solution, they also provide low-income access to healthy produce for struggling families. Reducing food-waste, saving money and improving health! There is also a growing trend of creative and innovative ways to reduce food waste. Technological innovations such as food waste applications are becoming quite popular. In the UK the “Too Good To Go” app creates a platform for restaurants to sell their leftover meals. There are also a number of apps, such as OLIO, that help supermarkets sell food before it reaches its “best before” date. The seller will list the items that must be sold in the next 24 hours along with the discount price, then the app users can browse the app to find good deals. These are only some examples of how the food-waste movement is growing, and awareness is spreading. More and more we see the emergence of grassroots organizations, start-ups, NGOs and charities that exist to rescue food from the garbage bin, and divert it towards somebody’s dinner table. But food waste prevention can also start at home. There are many tips one can follow to prevent food-waste, such as changing our housekeeping, purchasing, and cooking practices. We must reconsider our relationship to food, and remind ourselves that having access to healthy food at all time is a huge privilege. There are, after all, millions of kids who fall asleep hungry every night, remember? But what do my leftovers have to do with the hungry kids? For the inseparable position that our personal habits as consumers have on the global food chain, and for the influence the food chain has on our global environmental, economic and social systems, our eating habits matter a lot. When we let a hand of bananas go black and stinky to be discarded immediately, and this happens week after week: our actions are having a direct influence over the lives of the banana farmers in Costa Rica, over the burden that the international banana demands pose on the biodiversity of the region, over the adverse effects this burden has on the climate, and because of that, over the health impacts all of this has on our population. We do not live in a vacuum. The walls of our kitchen do not separate us from the rest of the world. What we eat and what we don’t eat affect everything. So, listen to your mama, and eat all your food.